The gang of Madagascar is back in an all new adventure! I thought their first adventure was just so-so, and thus wasn't expecting a whole lot from this new one, but it turned out to be enjoyable enough. Better than the original, I think, but still nothing spectacular. 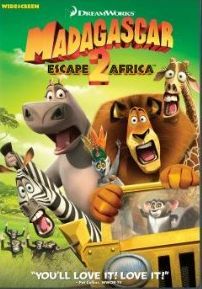 All the main characters from the original are here, Alex the Lion (Ben Stiller), Gloria the Hippo (Jada Pinkett Smith), Marty the Zebra (Chris Rock), Melman the Giraffe (avid Schwimmer), plus the scene-stealing penguins and some of the slightly annoying lemurs. As the story starts off, we see Alex the Lion as a little lion cub with his dad, Zuba, who is king of the lions. Zuba tries in vain to teach young Alex (then called Alekey) how to attack, but Alex is much more interested in dancing around. Then another lion named Makunga (Alec Baldwin) challenges Zuba for leadership, and in the minute it took Zuba to defeat Makunga, little Alex ran off to chase a rope, leading him to a bunch of hunters. Zuba tries desperately to save him, but Alex winds up in a box floating down a river, and ends up on a ship bound for New York. While in mid-flight, the plane runs out of gas and plummets to the ground. Everyone is able to make it off okay, but find that they are not in New York... they're in Africa! After an awkward meeting of the natives, everyone seems to take a great liking to their new home. Alex is reunited with his parents, Gloria finds other hippos and develops a crush on one particularly muscular male, Marty discovers a whole ton of zebras all of which have his exact personality, and Melman, because of his "medical experience" winds up as doctor for all the giraffes. Everything things to be going wonderful... so we all know it's now about time for everything to go South! But there's no need to get into all that here. Just watch it for yourself, as it's worth a once over. The open African scenery in this film is much nicer than the dense jungle of the first movie. There also seemed to be more humor in this one, or at least that's what it felt like. I only saw the first movie once, and that was when it originally came out, so it's hard to remember exactly. Also, each of the characters seemed to have their own mini-stories taking place, so even though the main focus was on Alex, the other characters played a part. 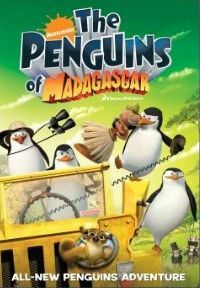 In addition to the single DVD release, there is also a 2-Disc version where the second disc is called The Penguins of Madagascar . This disc is LAME! There are two shorts about the penguins, each one being about 10 minutes long. They are okay, mildly funny, but definitely not deserving of their own disc. Then there are a few extras, but nothing worth checking out. The first disc has some decent extras, including a commentary, a look at the voice cast, a look at the African excursion the filmmakers took for research purposes prior to animating the film, and a couple behind-the-scenes featurettes which were fun to watch because it showed the animators playing out scenes like they were little kids playing on their parents furniture.